The Mr. and I made this last night as our contribution to a Godfather viewing marathon at a friend’s house. It was a delightful and filling addition to the menu, and even though there were more omnis than veggies at the gathering everyone loved it. Just be forewarned that this is the lasagne motherlode; we still wound up with leftovers after feeding 12 people, so if you’re just making this for dinner at home you should halve the recipe and use a smaller baking dish! Make some cashew creme. In order for you to have enough for this lasagne you’ll need to double to batch OR make as usual but add twice as much lemon, braggs, and salt, and then crumble a block of extra firm tofu in there. Set the creme aside and start in on making your other two layers: a mushroom mixture and a sauce. Choose a nice deep saute pan and sauté the mushrooms, onion, and garlic over medium heat in the 2 Tbs of water until the onions are translucent and the mushrooms are moist and soft (7 – 10 minutes). Add the spinach and stir, then cover and saute, stirring frequently, until the spinach is soft and wilty. During your down moments from dealing with the mushrooms and stuff, put all three jars of sauce into a large pot, add the rest of the spices plus the olives, and heat through. Spread a thin layer of sauce in the bottom of a 10×15-inch pan. 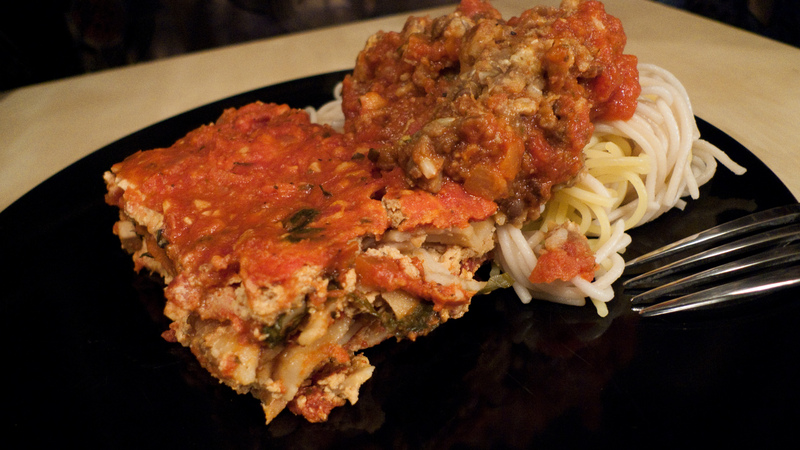 Place a layer of noodles over the sauce, covering as much surface as you can without overlapping. Next add a serious layer of sauce, then add a layer of the mushroom mixture, then a layer of the cashew creme. Spoon the cashew creme out at regularly spaced intervals and then spread it around using a clean spatula or knife. Now you’re ready for another layer of noodles, but this time lay them in the opposite direction of the layer of noodles you already put down. Repeat the sauce, mushroom mixture, and creme routine until your last layer ends up being sauce on the very top. This is important because you’ll want that sauce spread all the way out to the edges and covering every inch of noodles so that the noodles can use the moisture from the sauce to cook while you have the lasagne in the oven. Cover the dish tightly with foil, and bake for 1 hour. Let it stand for about 15 minutes or so before you try to serve it, as it will stand up much better after it’s cooled a bit. This was amazing, but I see now why my mouth was on fire: cayenne pepper AND red pepper flakes! 🙂 But it was delicious and I loved it.